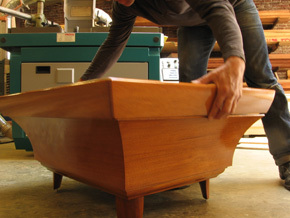 Ray Buffalo Fine Woodworking manufactures custom one-off studio furniture. 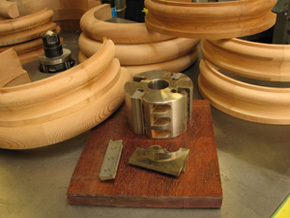 Ray designs, builds and hand finishes pieces on the premises according to customers' needs. Pieces often combine metal and wood and all wood is solid lumber. Curved and profile shaped wood is a key feature to every design. Each piece walks a line between sculpture and serious furniture. Finishes are typically, hand rubbed varnish over dewaxed flake shellacs such as blond, lemon, orange or garnet. Vanish sealed casein or milk paint opaque colors are also used for aesthetic accents. All furniture is designed and built to last a lifetime. See the contact page to ask Ray about his custom furniture. Ray Buffalo Fine Woodworking also specializes in curved moldings; for example, arched casings, arched jambs, curved crowns, baseboard, bar rails and handrails. All of these are fabricated from a variety of solid woods. The molding profiles are largely custom to match customer's sample and application. Small batches of custom architectural components such as decorative brackets, curved cabinet doors or curved mantel parts are also available. See the contact page to contact Ray about moldings or custom architectural components.